What can you do with those leftover potatoes—besides simply reheating them? And if you’re going to reheat them, what are some good options? If you’ve ever had leftover French fries, mashed potatoes, or baked potatoes, you probably realized that upon being reheated they seem to lose something in terms of appeal. Either they don’t reheat evenly or they become too dry and starchy. At even the most upscale restaurant, it’s not uncommon for people to forego taking their unfinished portion of potatoes home precisely for this reason. However, instead of being frustrated or disheartened by wasting food or forcing yourself to eat a mediocre side, with the following simple suggestions you will look forward to your next pseudo-leftover meal. Bake them again—and I’m not talking about simply re-baking them. 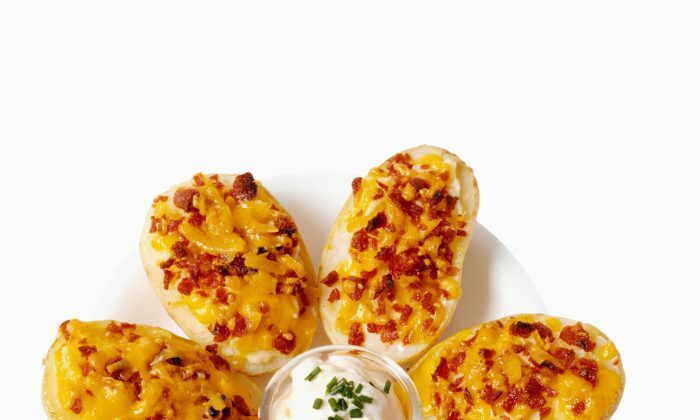 Instead, turn them into double-baked potatoes. Cut each baked potato in half if not halved already. Scoop out the potato from the skin, put in a mixing bowl, and mix it with your favourite cheese and a little bit of sour cream until it forms a mushy consistency. Scoop the mixture back into the skin and place the potato halves in a toaster oven or under a broiler for about 10 minutes or until slightly golden. Another option is to scoop out the cooked insides and make it into a potato salad. For the leftover skins, fill them with shredded cheddar cheese, scallions, and bacon bits, and bake in a conventional oven for about 15 minutes at 140º C (275º F). These can be transformed into cream of potato soup by placing the leftovers in a pot, combining them with whole milk or heavy cream, and mixing until they reach a desired consistency. Mix in some finely chopped precooked bacon, ham, or pork belly and some scallions; simmer for about 30 minutes. Mashed potatoes can also be transformed into gnocchi, cavatelli pasta, or made into potato pancakes. Fries can be reheated, but they are tricky. If heated too thoroughly they can become dry and too crunchy, and if not heated sufficiently they become limp and take on a displeasing starchiness. I’ve had a lot of success by reheating French fries in a cast iron pan on medium-high heat but without adding any oil. Heat the fries for three to five minutes. They will start to expel the oil they were originally fried in, causing them to refry themselves. Stir or toss the fries occasionally for about 15 minutes and they should be near original quality. Any potato, be it baked, fried, boiled, or mashed, can be made into an omelet, Spanish tortilla, frittata, or strata—all basically the same thing with a different name. Butter or oil the inside of a casserole pan, then spread out the mashed potatoes, or if they are baked or fried, chop them into small cubes and spread evenly in the pan. Mix in an amount of beaten eggs equal to that of the potatoes. Shredded cheese and chopped vegetables can also be added. Mix well and bake at 180º C (350º F) for about 35 minutes.